Ellie Kendrick as Meera Reed, Isaac Hempstead Wright as Bran Stark and Joseph Mawle as Uncle Benjen in Season 6 of Game of Thrones. Photo Credit: Helen Sloan/courtesy of HBO. This week’s episode picks up almost right where it left off — poor Meera Reed (Ellie Kendrick) is stuck dragging Bran Stark’s (Isaac Hempstead Wright) body in the snow now that Hodor (Kristian Nairn), their friend and personal transporter, is dead. Let’s hope he didn’t become a wight because they would have no chance against that giant. 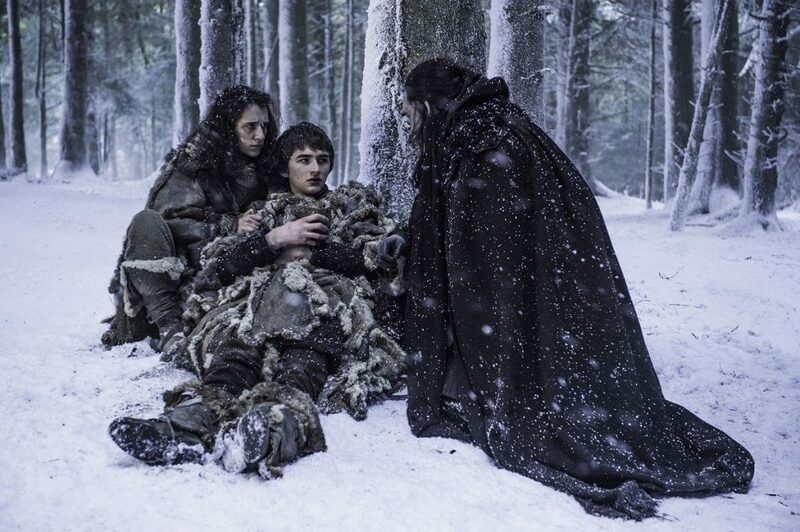 Meera eventually collapses from exhaustion, and she and Bran know that it’s over. “They found us,” Bran says. Perhaps it’s the shock and guilt of Hodor’s death on his mind, or he’s simply tired of running (although he’s not the one doing any running around here), but Bran looks like he’s ready to give up and give in to the wights. Lucky for him, it seems someone is always there to bail him out. This time it’s a hooded figure, who, quite predictably (and that doesn’t happen very often in Game of Thrones), is Uncle Benjen Stark (Joseph Mawle) — or cold Uncle Benjen. We last saw him in Season 1, before he went missing and was presumably killed beyond the Wall. It was one of the longstanding mysteries of the show, and now we finally have answers. “The Children found me and stopped the Walker’s magic from taking hold,” he says. And ever since then he’s been working with the late Three-Eyed Raven, who sent him on his new mission before he died — to help Bran prepare for the White Walkers. 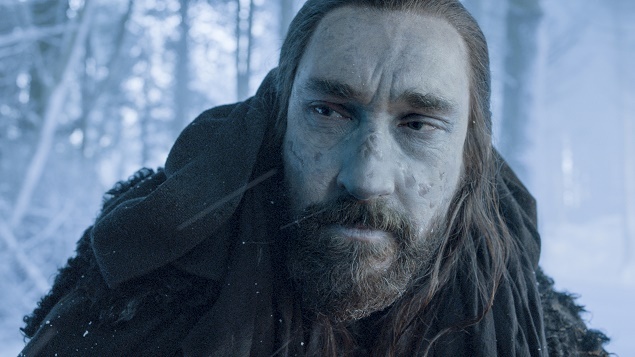 Joseph Mawle as Uncle Benjen in Season 6 of Game of Thrones. Photo Credit: courtesy of HBO. 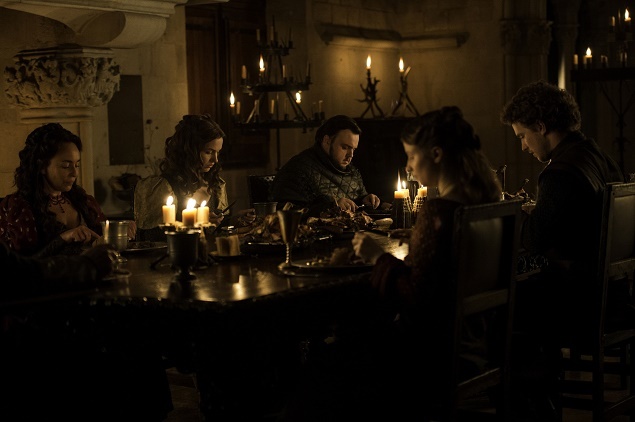 Samantha Spiro as Melessa Tarly, Hannah Murray as Gilly, John Bradley as Sam Tarly, Freddie Stroma as Dickon Tarly and Rebecca Benson as Talla Tarly in Season 6 of Game of Thrones. Photo Credit: Macall B. Polay/courtesy of HBO. “Ha! There’s no such thing [as White Walkers],” Sam Tarly’s (John Bradley-West) brother, Dickon (Freddie Stroma), says during his hometown visit to Horn Hill. After all of the White Walker encounters we’ve seen on Game of Thrones, it’s easy to forget that not everyone in Westeros has had the same chilling dose of live corpse attacks as Jon Snow (Kit Harrington) and Sam have experienced before. But at least someone had a good laugh during one of the most awkward family dinners ever… We’ve all, more or less, experienced one of those, when you eat in deafening silence and there’s that one drunken uncle making crude remarks — only in this case, it’s Sam’s dad making the conversation uncomfortable, and he’s not drunk, just plain mean. 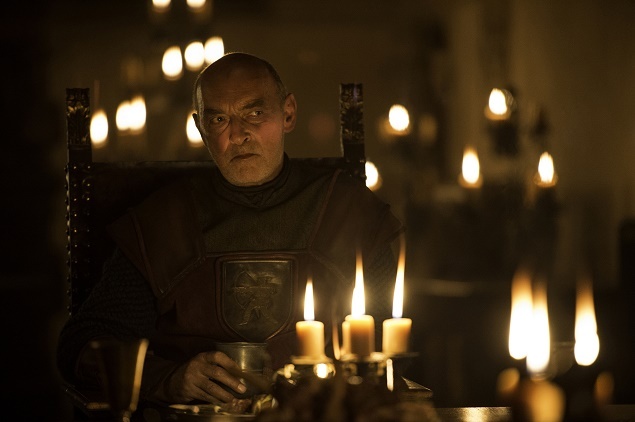 There are only so many complaints Lord Randyll Tarly (James Faulkner) can make, either about dining with a Wildling or having a son that’s a huge disappointment, before it becomes necessary to leave the room. James Faulkner as Lord Randyll Tarly in Season 6 of Game of Thrones. Photo Credit: Macall B. Polay/courtesy of HBO. “I’m angry that horrible people can treat good people that way and get away with it,” a dressed-up Gilly (Hannah Murray) says. Well, after that Sam manned up slightly, and gave his own version of an “f-you” to his father by stealing the family sword off the wall — and don’t think we didn’t notice that it’s made of Valyrian steel. With the White Walkers on Bran’s tail and headed farther south, it’s only a matter of time before they end up in Westeros. But Sam’s not the only one stealing swords. 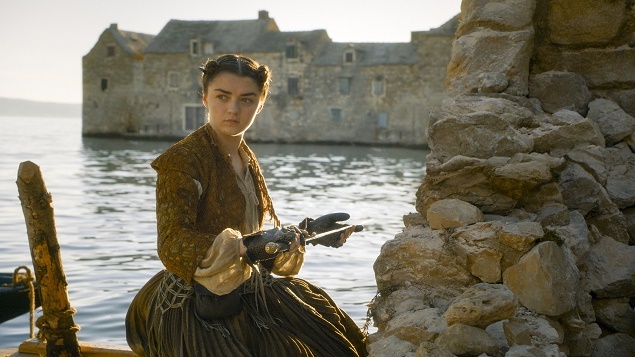 In Braavos, to our delight, Arya Stark (Maisie Williams) steals back her sword, Needle, from where she hid it in Season 5, giving up her plan to be “no one.” Thank God. Unfortunately, the Waif (Faye Marsay) saw Arya sabotage her own mission to poison Lady Crane, and she is now determined to find her and kill her. After all, Jaqen H’ghar (Tom Wlaschiha) did say, “One way or another a face will be added to the Hall.” We all know no character is safe from death on Game of Thrones (poor Hodor, we’re still not over it! ), but I’m confident Arya is going to make it, Waif or no Waif, and will stick it to her (with Needle, perhaps?). Maisie Williams as Arya Stark in Season 6 of Game of Thrones. Photo Credit: courtesy of HBO. Emilia Clarke as Daenerys Targaryen in Season 6 of Game of Thrones. Photo Credit: courtesy of HBO. The same goes for Daenerys Targaryen (Emilia Clarke), who now seems stronger and more determined than ever. Somewhere in the sandy mountains outside Vaes Dothrak, Daenerys finds Drogon and hops on, giving her most enthused speech yet about taking back the Iron Throne and so on. You have to wonder if she’s starting to go power hungry, so much so that she might be channeling her father, the Mad King, because this speech had no real purpose other than to demonstrate her own importance — and it came out of nowhere. I mean, the Dothraki were already following her after her God-like walk through the flames two episodes ago — did she think they needed some reassurance? Perhaps producers wanted to drum up some excitement after the so-called attack on the High Sparrow (Jonathan Pryce) fell completely flat. 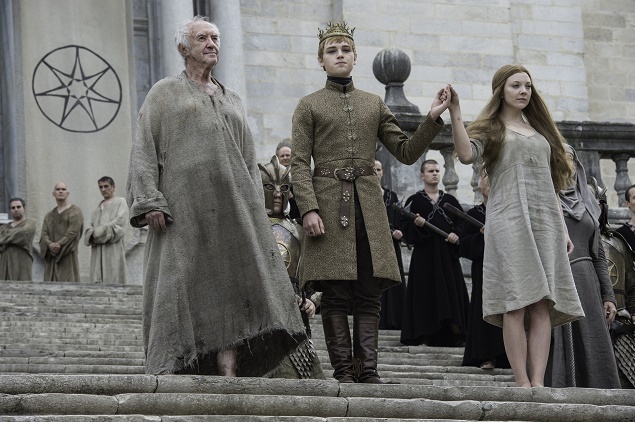 Prior previews had suggested a climactic overthrow of the High Sparrow before Margaery Tyrell’s (Natalie Dormer) walk of atonement, but Tommen Baratheon’s (Dean-Charles Chapman) naiveté and kingly decision to unite the Sept and the crown doused any hope for a fight. I hope Margaery’s plan is somehow behind Tommen’s stupid move, otherwise it’s going to continue to be a fruitless, boring battle against the High Sparrow for the rest of the season. Jonathan Pryce as the High Sparrow, Dean-Charles Chapman as Tommen Baratheon and Natalie Dormer as Margaery Tyrell in Season 6 of Game of Thrones. Photo Credit: Macall B. Polay/courtesy of HBO. Unless, of course, Cersei Lannister’s (Lena Headey) trial by combat actually happens, and by that we mean that Franken-Mountain riles up some action (lest we forget the last trial by combat between him and Oberyn Martell? It was mind blowing!). Or if Jaime Lannister (Nikolaj Coster-Waldau) manages to convince Brynden “Blackfish” Tully (Clive Russell) to lend his forces and help. “Show them what Lannisters are, what we do to our enemies,” Cersei says. They’re nice fighting words, Cersei, but after seeing your naked walk, and with your current short hairdo, it’s less convincing — and my guess is that Uncle Brynden will think the same. And why should he help the Lannisters when they were behind the Red Wedding that killed his sister and nephew? Oddly enough, Walder Frey (David Bradley) appears this season for the first time since the Red Wedding aftermath, hell-bent on destroying the Blackfish. We know what happened to Catelyn and Robb Stark after that infamous episode, but we completely forgot about Catelyn’s older brother, Edmure Tully (Tobias Menzies), who’s still being held hostage as collateral. Hang in there, Edmure. Help is surely on the way. 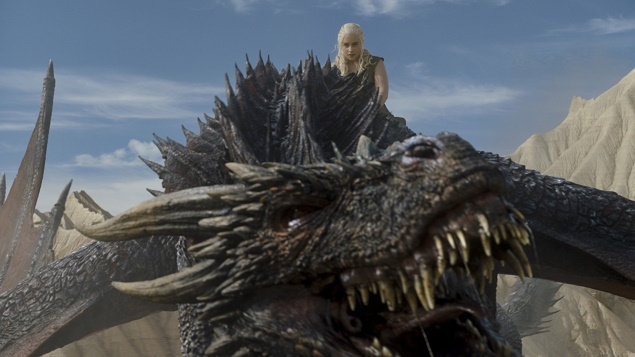 Catch an all-new episode of “Game of Thrones” on HBO on Sundays at 9 p.m.